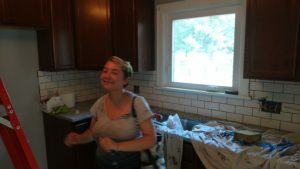 This past week, my husband, brother, and I stopped over to check on the rental house–the first time the three of us had been there together since the place caught on fire. The contractor’s work seems to be moving along well–they have drywall up everywhere, and of course, rough-in plumbing and electric. It was encouraging to see. And better yet? Not one whiff of smoke. One thing I can tell my writer friends is that there is nothing like the smell of burnt house. I went over there the day after the fire and, holy cow, the smoke smell was overpowering! As a writer, I’m supposed to be able to describe sensory details, but the pervasiveness of the smoke smell in that house almost defies description. It was so thick I could almost see the carbon molecules in the air I was breathing. And all I could think of was how fast I wanted to get out of there. A couple months ago, I read a novel in which a character entered a recently-burned building. I could tell this author had not had that experience, as she barely even mentioned the smoke, much less how cloying and sickening it is (especially when there are emotions attached to it, as there should have been in the story). (Otherwise, the book was very good.) It wouldn’t have taken much, aside from how strong a smell it is. It mostly smells like a bonfire, but has an underlying, sickening chemical smell. It’s close enough that for the next few months, whenever one of my neighbors had a fire in their backyard, I was taken back to the rental house. I can’t imagine how much worse it would be for someone who’d lost their home to a fire. One of our friends had, in an apartment fire around twenty years ago. We took her inside the house a couple days after the fire, and she said it smelled exactly like the burnt apartment building. And yes, she had to get out quickly. Now, I don’t mind being there once again. There is a new furnace in the rental house, so when we went inside it was comfortable (though we kept our coats on, because the contractors had the heat turned down–thank you!). They are getting ready to finish the drywall next. We had a progress meeting with them this Friday. While progress is good, that’s where the good news ended: we are going to be over-budget, unless we take on some of the work. As in, the estimates for all the work done so far plus what’s still to come exceeded the insurance estimate by about $15,000. 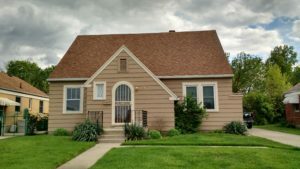 Apparently, the savings found in drywall and OSB roofing were not enough to offset the new bathroom, and siding the detached garage so it would match the house (insurance wouldn’t cover the garage, as it was not affected by the fire). So I spent all day yesterday poring over their 42-page detailed estimate, and pulling out line items we could cover. Most of this was purchasing materials, as they put an “overhead and profit” markup on everything. Others were things like installing towel bars and TP holders – they charge over $13 to do one. I don’t have a problem with that as it’s simply paying for their time, but they’re willing to let us do that and save some $$, so we definitely will. My husband may wind up refinishing the hardwood floors again, too, as that would save over $6,000. What I’ve been Reading: This week, it’s been mostly my own WIP. But I’ve also continued to binge on a blog I found a couple weeks ago. Over this past year, I’ve discovered blogs outside of the writing community, mostly focused on 1) DIY, 2) Homesteading (I’m not interested in doing so, but I find it fascinating), 3) home building (surprise) and 4) Financial Independence. This week’s blog binges have fallen into category 4. One is www.1500days.com, in which the author describes his march to financial independence, with a goal of reaching it within 1500 days of when he started the blog in 2013 (spoiler: he succeeded). He has a really funny, engaging writing voice, plus there are sometimes plastic dinosaurs and fart jokes (check out the dinos drinking beer at the top of the screenshot). I’ve become fascinated with FIRE (Financial Independence/Retire Early), and will probably blog about it more in the future. What I’ve been Writing: Still not much–actually, nothing besides this blog post. I probably spent too much time reading 1500days.com and not enough reading my WIP, as I did not complete reading it yet. I’m close, though, so this week’s goal is to finish what I have, and begin writing the next scene. What about you–have you ever been inside a burnt building? What have you been reading lately? What are some of your favorite blogs? Please share–I’d love to hear from you! Last week, I blogged about part of my seemingly-uneventful, but actually eventful 2017. Much of what went on was house-related, although not about the new house we hope to begin building this year. Rather, much of our focus was on the rental house we bought in March. Buying another rental property in this area, when we’re planning to move within the next two years, was not part of our plan. But when my husband’s cousin’s widow posted on Facebook that she wanted to sell her house, my husband was intrigued. His cousin had passed away in 2011, and she was engaged, and ready to move on. He asked how much she wanted for her house, and the figure she named was too good to pass up. We took a look through the house, a little Cape Cod built in 1945. Luckily it had a mostly-unfinished basement, so it was easy to see electrical, plumbing, and HVAC, all of which had been recently updated. The foundation, basement, floor joists, and so on were really solid and in great shape. The roof was also fairly new, and she’d had the place painted a couple years before. 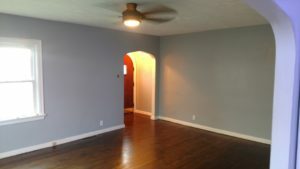 It needed work, but it was all cosmetic–paint, new flooring, new kitchen and bath. We’ve done that sort of work before, so no problem. The only problem was we didn’t want to take out a loan, and we’d spent most of our ready cash on our land in Tennessee. That turned out not to be too much of a problem, since my brother was looking for a good investment opportunity. So we partnered with him, the deal being that he paid for the house, and we paid for the rehab, with my husband doing most of the work. Our cousins’ new house wasn’t quite done, so we rented the place back to her for a couple months. When they moved out in May, the work began. My husband tiled the screen porch, with tile the seller had left just sitting in boxes. He pulled up the carpet–and found lovely, original hardwood floors beneath it. They did need some patching (from registers that were larger than the ones now in the house), and refinishing. YouTube, Pinterest, and blogs are a great resource, and in about three weeks, he learned how to do it all, and did a fantastic job! He also installed new light fixtures, and a ceiling fan that looked great. I spent most of my summer weekends there, helping with the flooring–wiping, staining, wiping some more, and applying polyurethane. I also helped paint, and finished out the walk-in pantry by building custom shelves and painting the whole thing. It was originally a coat closet, as it had a single, high shelf and a bar, but the former owner had used it as a pantry, with shelf units sitting on the floor. Much more useful, and an unusual feature in a house this age/size. We put new cabinets in the kitchen, granite countertops, and added a subway tile backsplash. Through it all, we had help from our daughter and several friends (of ours, and hers). My brother worked on a few electrical upgrades, such as adding light switches in the basement, rather than pull chains. He’s an electrical engineer and has done commercial wiring before, so he knows what he’s doing. We took an afternoon off to move our daughter to Columbus, where she got a job. After we got home and had dinner, my husband and brother met up back at the house. We still needed to figure out what we were doing with the upstairs, which was two small bedrooms, so they went up there to talk about it. It was hot (this was the end of July) so they turned on the whole house fan, then went back downstairs to finish installing light fixtures in the kitchen. The whole back part of the attic was ablaze. My husband says he could’ve beat any Olympic runner getting out of that house! Luckily, the fire department was literally around the corner, and they arrived quickly. My husband came home at 4 AM to get our insurance information. The best thing was, no one was hurt, and the fire didn’t spread to any neighbors’ houses (which were only 15-20 feet away). The fire was pretty much confined to the second floor, and the ceiling in the kitchen and one bedroom. But the whole place was pretty much trashed from the smoke and water damage. In short, a whole summer up in smoke. Fortunately, we have very good insurance. 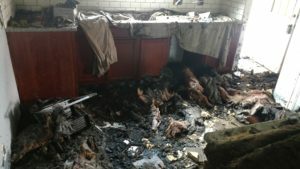 They quickly determined that the fire was definitely accidental–after all, who’d set a house on fire after doing all that work on it–and leaving $4000 worth of tools inside? 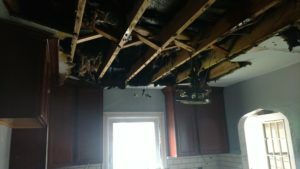 It was clearly some bad wiring–and investigators found tons of just that in the upstairs walls, and around the whole house fan, where the fire started–places no one could see with the walls and ceiling intact. They referred us to a restoration contractor, who got to work on it the following week. My husband’s tools were replaced. Insurance paid for three months of lost rent. Even better–these old houses were built to last. The roof wasn’t OSB or even plywood, it was made of 1 x 6’s –and our insurance paid for it to be rebuilt that way, and with plaster walls. We had it rebuilt with OSB, and with drywall, and saved enough money to make the upstairs into a wonderful master suite with a fantastic bathroom. Since there was no one living there, we told them to take their time. We’re expecting it to be done by March–a year after we bought the place. Since the contractor took over, there hasn’t been much to do other than provide them with details about what we want for the renovation. But it was still discouraging after all the work we’d put into it, especially for my husband. It’s in the contractor’s hands now (and so far, looks great!). But at this point, we just don’t have the heart to rent it, so we’re planning to sell. Hopefully, the second bathroom and the walk-in pantry (that they’re rebuilding just like I’d done) will be big draws to buyers. We went back to Tennessee in November, mainly to look at some apartments. We want to sell the ones we own here, and buy one there by the time we move. If we find a good deal, we can do this sooner rather than later. We connected with a great broker, and when she found out we were building, referred us to a couple of builders. DH: I know I’m from Ohio, and I’m 300 miles away. I know about how much this house should cost to build, and I know a lot of you guys are busy doing insurance work in Gatlinburg. So let’s just cut to the chase, and you tell me, how bad are you going to screw me? They both met us out at the property. The other guy was okay, but this one really had some good ideas about the placement of the house, and had even taken the time to come out on his birthday. We got the other guy’s estimate a couple weeks later. It was still over our budget, but by much less than the three builders we’d talked to earlier in the year. Then the joker’s bid came back… less than 10% over our budget, and totally workable! The past couple of weeks on the treadmill (too cold to walk outside, that’s for sure) has been The Millionaire Next Door, by Thomas J. Stanley, part of my ongoing effort to read more nonfiction. This is one of the classics of personal finance books, and people rave about it. Honestly, I’m not sure why, as the principles are really simple: most millionaires live a simple life, in modest homes, and driving modest cars. Spending less than they make and investing is how most of them became millionaires. It’s also very outdated–it was published in 1996, and this is very clear in the salaries and home prices quoted, as well as things like the lack of references to smartphones, the Internet, etc. (For example, travel agent is a good job??? How many are still in business with the Internet?) Still, it’s not a bad book, and if one adjusts the monetary amounts and a few details to take technology into account, the principals are still valid. This week, NOTHING! But that was the plan–In an effort to get back into my book, I wanted to go back and read what I have so far. I got about halfway through–that book is long. Too long! I am seeing lots of places I can cut, though it will still end up being a pretty long book (as most of mine are). So this week’s goal is simple: finish reading the book. Any writing will be a bonus. So, did our rental house saga turn out how you expected? What do you think of it? Have you read (or heard of) The Millionaire Next Door? How are you doing with whatever goals you may have so far, whether writing-related or not? Please share–I’d love to hear from you!